Lex Luthor is giving a press conference at the ribbon ceremony for a new building he is constructing in Metropolis. Story - 5: We have come to the Final Chapter in our prequel comic adventure. And, it's another solid issue. We finally get to see Lex Luthor's story a little bit, rather then just the small teases we have seen in the previous issues. Lex is giving a press conference at the site of his destroyed LexCorp Tower, that we saw get demolished in MAN OF STEEL. Once again for the doubters in fandom, they are driving home the point that they are addressing the arguments and issues that stemmed out of MAN OF STEEL. This is a direct continuation of the story that began in MOS. It's not called MAN OF STEEL 2, but it's a direct sequel nonetheless, that just happens to include BATMAN and WONDER WOMAN (among others). I wish people would get off the "stand alone" sequel train and realize that this just might be better. As long as SUPERMAN is a major player in the story being told I don't have an issue with not seeing a "stand alone" sequel right away. Back to the story... As Lex is wrapping up his press conference he gets accosted by a reporter who asks him about all the other companies that left the city and now seem to be reversing course due to his actions. We see one in particular is mentioned... Hello KORD INDUSTRIES! Will Queen Industries or Maxwell Lord be too far behind? Publicly Lex is trying to deflect credit, but it's hinted that he knows exactly what is happening because he manipulated them into having to come back. See, Lex has been buying all the distressed properties and lots left destroyed in the "Battle of Metropolis". And when these companies come back they will need land. LOTS of land. And guess who they will have to buy the land from? You got it. Lex Luthor! THIS is the Walmart version of Gene Hackman's Lex Luthor's land grab from SUPERMAN: THE MOVIE. I love this little nugget. It shows that Lex Luthor is two steps ahead of everyone else. He's the smartest person in the room wherever he goes and I love when that is shown. THAT is Lex Luthor ladies and Gentlemen. It's also very reminiscent of Rosenbaum's Lex. I'm intrigued about this Lex's opinion about SUPERMAN. While he does sour upon being compared to SUPERMAN by the reporter, his response to the claim makes perfect sense. Even in a private moment with Mercy (I assume she is Mercy, as her name is not mentioned here) he admits that it was an honest response. He is not a Lex Luthor that is Evil for Evil's sake. He just doesn't know enough about SUPERMAN to form his opinion one way or the other. I don't get a "hatred" vibe from Lex as of yet. Something tells me it will be his confrontation in BATMAN v SUPERMAN that will solidify his hatred for the Man of Steel. Lex can't control SUPERMAN because of his lack of knowledge and that is something that he just can't abide. Lex is a control freak. He needs to know everything. We are seeing this in these prequel comics. However, while he can't control SUPERMAN just yet, he is, as he states here, working on it. The second to last panel we get to see what he has been working on in a sense. On the monitors we have, ZOD and his ship, and a strand of DNA. Pretty safe to assume we are seeing a hint to "DOOMSDAY". This issue was a great final chapter to our little story and does what it was intended to do. It moves the plot forward. It actually felt like a scene from the movie. Final Thoughts: This has truly been a fun prequel story. Sometimes the comics can feel tedious and uninspired, or that they are simply going through the motions. This story feels like an extension of the actual movie, as if we are watching deleted scenes that were cut from the movie for time constraint. You have to give WB/DC credit. It really seems like they are truly trying to give the fans something special. That they want to get this right. And honestly, I think rival studios and Marvel can sense it too. Which is why you are seeing planted click bait articles that are spreading false rumors to hurt the movie's buzz. Marvel knows that their era of dominance is about to be SERIOUSLY challenged. I think BATMAN v SUPERMAN will be a game changer for comic book movies and I'm truly excited. Has there ever been a better time to be a comic book fan? Art - 5: Seriously, these guys have made a lifelong fan. I will buy or read anything they create. They are by no means perfect or up there with the Lee's or Taylor's of the world, but they are at the top of the next tier in my opinion. They have a great ability to draw facial expressions that manage to look like their real life counterparts. Very talented. Cover Art - 5: Ok, I'm just gonna come out and say it... 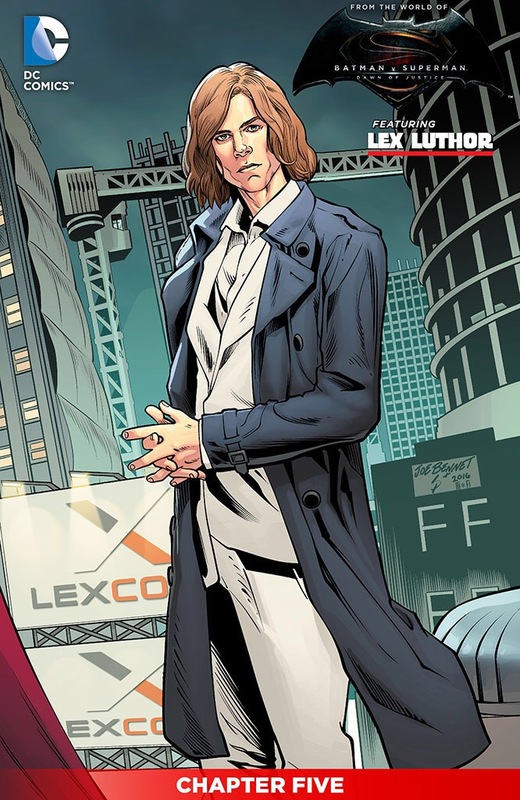 I dig the long hair look on this Lex Luthor. It works for the page. I hope it works on the big screen until he ultimately loses it. Another great looking cover, with beautiful and vibrant artwork. Excellent use of coloring and shading.